YES! YES! YES! Lightweight Diego Sanchez received some home cooking from two of three judges in his hometown of Albuquerque, New Mexico this past Saturday in a highly controversial split decision victory over Ross Pearson (pictured) at UFC Fight Night 42. The bad news for MMA fans is that abysmal judging still seems to be par for the course in the sport. The good news for Pearson fans is that UFC president Dana White knows what time it is and will treat Pearson as though he won. “It was horrible,” White told ESPN.com. “In the second round, Diego got dropped and one judge still gave him that round. Insanity, man. Pearson got robbed. Pearson won that fight clearly. He easily won that fight. We have to treat Pearson like he won and give him that next level fight. 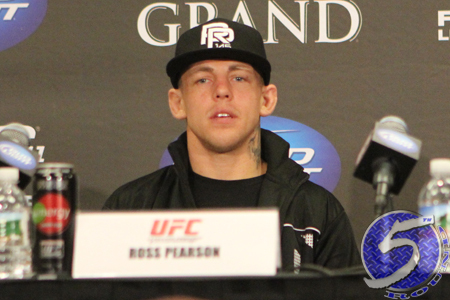 To put money where his mouth is, White awarded Pearson with his $30,000 win bonus. White didn’t say where this win leaves Sanchez, who desperately needed the W because he had dropped three of four, including two straight, prior to Saturday. Judges Jeff Collins and Chris Tellez each scored the bout for Sanchez, 30-27 and 29-28, respectively. Judge Marcos Rosales had it 30-27 in Pearson’s favor.